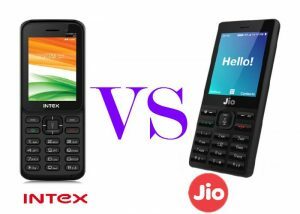 Reliance chief Mukesh Ambani has been announced free of cost a 4G feature Phone dedicate to you at the company’s Annual General Meeting on 21 July 2017. 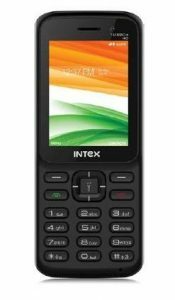 After then Intex company has launched their first 4G VoLTE-enabled feature phone called Turbo+ 4G along with the price range of rupees 1500 to rupees 1900. But Reliance chief said users have to pay rupees 1500 refundable amount at the booking time and the amount will be refunded after 3 years. He also said it will be available for beta testing from August 15th and for booking from August 24th. But at the time, the Intex Turbo+ 4G come with a 2.4-inch QVGA (320 x 240) display with 2MP Back camera and VGA Selfie Camera. 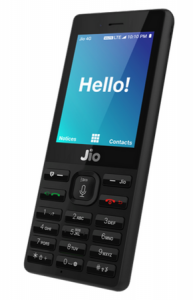 Then Reliance Jio giving to user a 2.4-inch QVGA (320 x 240) display and it is square design it has alphanumeric keypad along with a dedicated button for torchlight. The JioPhone supports all languages, and users can speak to the device via voice commands. The Intex Turbo+4G device runs on KaiOS software having a dual-core processor with 512MB RAM and 4GB ROM along with an expandable memory of up to 32GB. The 4G feature phone will also get high voice call quality and a wonderful experience of the internet. It has supports all twenty-two Indian languages, FM Radio, Flash and big Phonebook storage of 2000 contacts. Then the Reliance 4G Jio Company is giving people an option to browse Internet on the new JioPhone as well as pre-loaded Jio apps and users can watch movies using the JioCinema app. The Jiophone has an extra feature comes with NFC support something like Samsung Pay. The Jiophone comes loaded with features like expandable SD card slot, 4-way navigation and more.